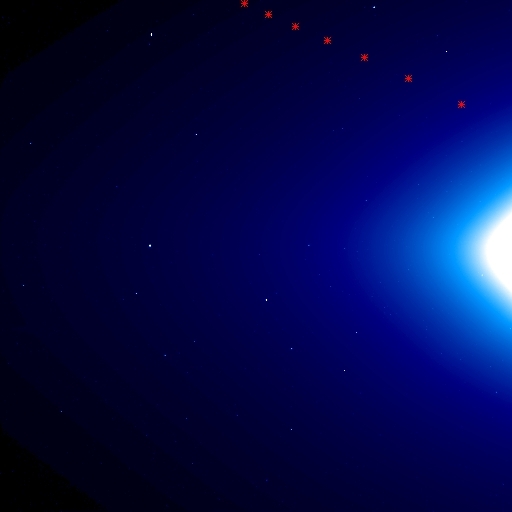 New: Where to view Comet ISON's encounter with the Sun. 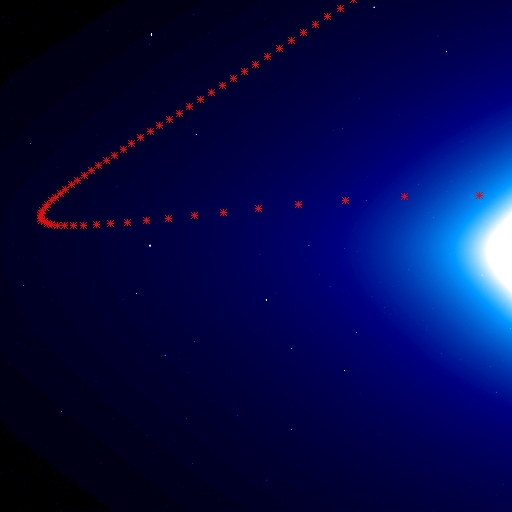 If Comet ISON works out as expected, the STEREO spacecraft should have a spectacular view. 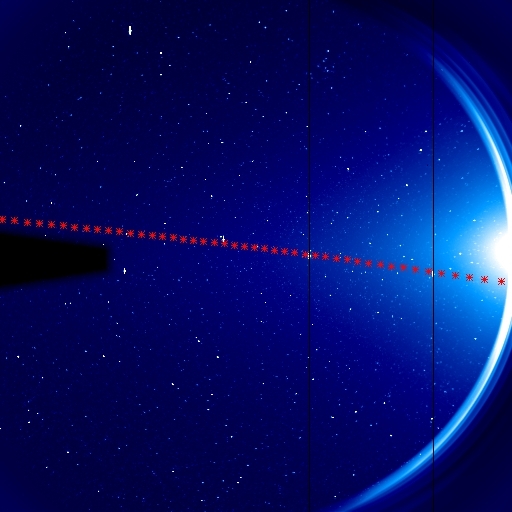 The movie below shows the geometry of the STEREO Ahead (red) and Behind (blue) spacecraft during the passage of Comet ISON (orange). The top panel shows the view from above looking down on the orbital plane of the planets (the ecliptic plane), while the bottom panel shows the view from the side. Note that the comet's orbital path is highly inclined to the ecliptic plane. As the comet approaches the Sun, it comes in at a fairly shallow angle, but leaves at a much steeper one, carrying it well above the ecliptic plane. If one only looked at the top-down view, it looks like the comet passes close to the Earth around the end of December, but the view from the side shows that this is not really the case. An even better way to examine the orbit of Comet ISON is to use this three-dimensional JAVA orbit tool provided by the STEREO SECCHI team. 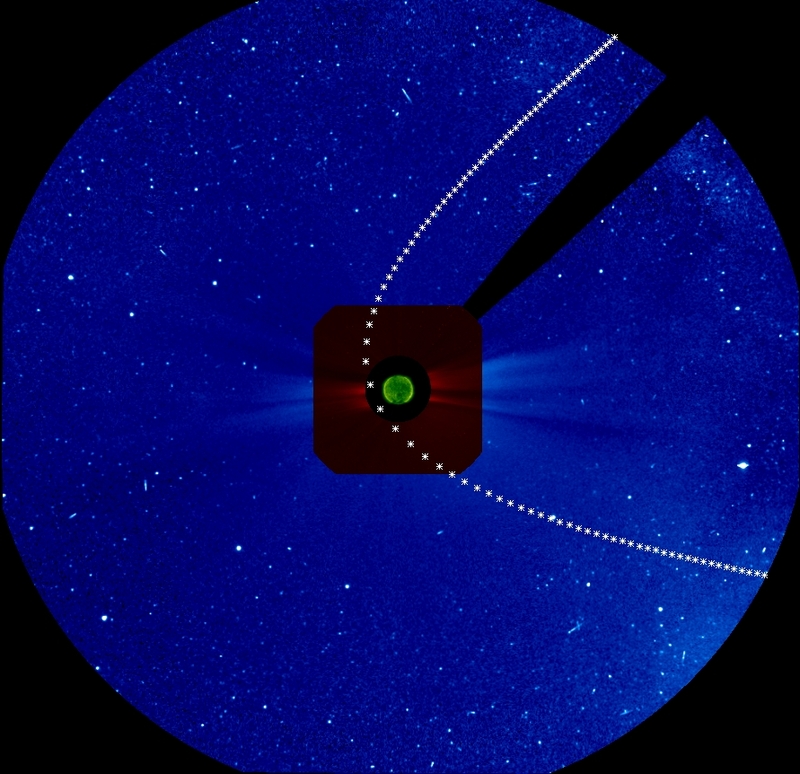 The first STEREO telescope to see Comet ISON will be the large angle Heliospheric Imager #2 on the Ahead spacecraft (HI2-A). The first image below shows the projected day-by-day location of the comet in the HI2-A field-of-view from October 10, 2013, when it is expected to enter on the left side of the field, through November 23, 2013, when it is expected to leave on the right side of the field. Next to this is the comet's passage through the smaller HI1-A field-of-view November 21-28, 2013. Click on each image for a larger version. Predicted day-by-day position of Comet ISON in the HI2-A field-of-view from October 10, 2013 on the left, to November 23, 2013 on the right. Predicted day-by-day position in the HI1-A field-of-view from November 21-28, 2013, moving from left to right. 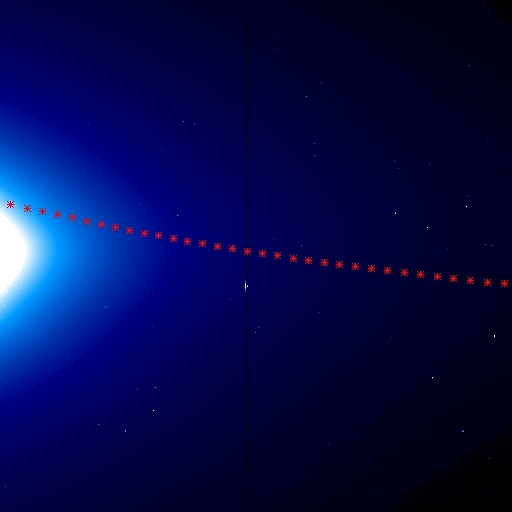 Predicted position of Comet ISON in HI1-B from October 24 on the right, to November 25, 2013 on the left, assuming a roll of 180 degrees. Also shown above is the progress of Comet ISON through the HI1-B field-of-view, assuming that the Behind spacecraft is rolled by 180 degrees. With this spacecraft orientation, the comet would enter from the right, and move progressively toward the Sun on the left. Each red symbol represents a day between October 24 to November 25. This roll angle would allow Behind to make occasional measurements at the same time as Ahead, which has the comet in continuous view during this period. Current plans are to roll the Behind spacecraft for 4 hours per day for three consecutive days per week (i.e. 3 days rolled, followed by roughly 4 days not rolled) between October 24 to November 20, and then 4 hours every day between November 21-26. Both STEREO spacecraft will have a view of the comet in the COR1 and COR2 coronagraphs in the hours around closest approach on November 28. This is shown for the Ahead and Behind spacecraft respectively in the images below. Click on each image for an enlarged view. In each case, the comet enters from the lower left and exits near the top of the image. The coronagraphs on STEREO Ahead will be able to see the comet for about a day and half between about 04:00 UT on November 28, and 13:00 UT on November 29. The Behind coronagraphs will have a longer look at the comet, from about 06:00 UT on November 26 until the end of the day on November 29. During the period when Comet ISON is closest to the Sun, it will actually pass in front of the Sun as seen from Behind. This opens up the exciting possibility that we might see extreme-ultraviolet emission from the comet, as was seen recently with the bright sungrazing Comet Lovejoy. Predicted hour-by-hour position of Comet ISON in the COR2-A (blue) and COR1-A (green) fields-of-view between 04:00 UT on November 28, and 13:00 UT on November 29. Predicted hour-by-hour position of Comet ISON in the COR2-B (blue), COR1-B (green), and EUVI-B (orange) fields-of-view between 06:00 UT on November 26, and 00:00 UT on November 30. Predicted position of Comet ISON in the EUVI-B field-of-view in ten-minute intervals between 17:50 UT and 20:00 UT on November 28, 2013. 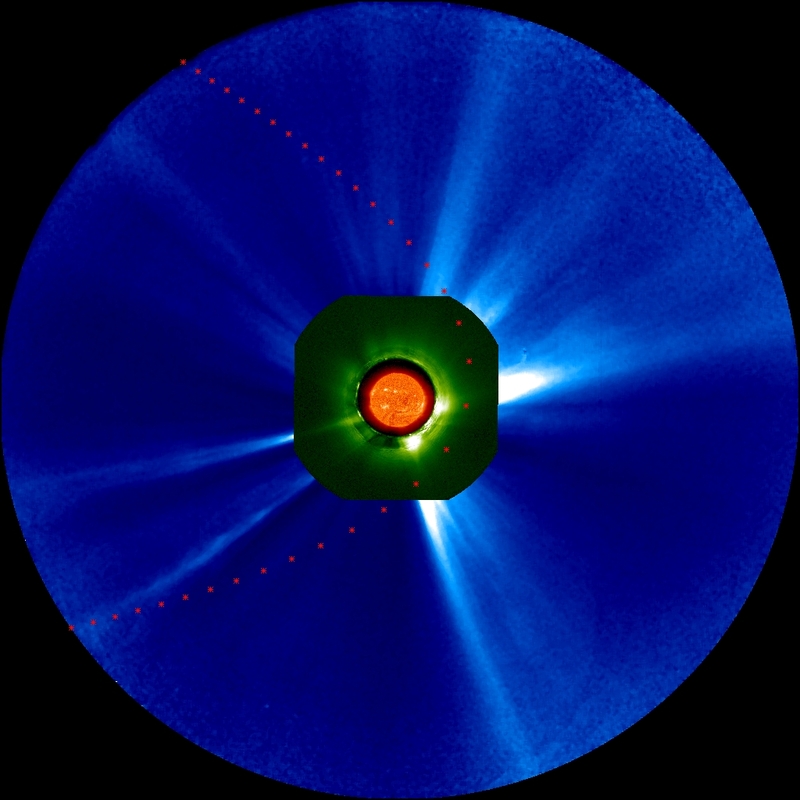 The LASCO C2 and C3 coronagraphs on the Solar and Heliospheric Observatory (SOHO) satellite will also have a view of the comet as it passes through their fields-of-view, as shown below. From SOHO's viewpoint the comet enters from the lower right early on November 27 and exits towards the top near the end of November 30. 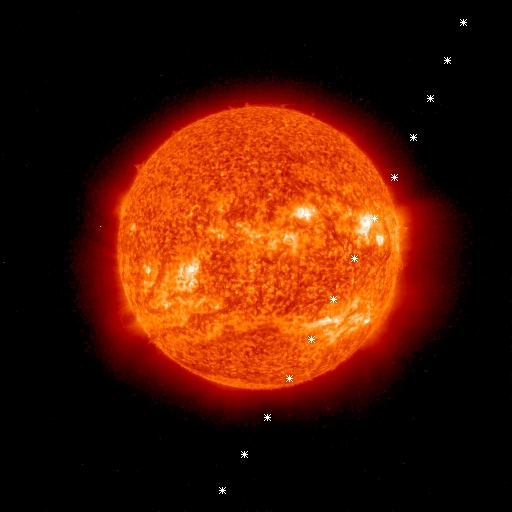 There's also a possibility that the Solar Dynamics Observatory (SDO) satellite might be able to observe Comet ISON in extreme-ultraviolet when it's closest to the Sun. However, at the currently estimated apparent distance of 1.8 solar radii, SDO would have to point away from the Sun to see the comet. Predicted hour-by-hour position of Comet ISON in the LASCO C3 (blue) and C2 (red) fields-of-view on SOHO, November 27-30, 2013. Click on the image for a larger version. After the comet swings around the Sun, it passes once again through the HI1-A field-of view during the first week in December, as shown below. At this point, the comet is leaving at such a steep angle that the nucleus never passes through the HI2-A field-of-view without rolling the spacecraft, though a tail might be visible. Predicted day-by-day position of Comet ISON on the outbound journey in the HI1-A field-of-view from December 1-7, 2013, moving from right to left. Click on the image for a larger view. To keep observing Comet ISON after December 7, the Ahead spacecraft would also need to be rolled. The image below shows the progress of Comet ISON through the HI1-A field-of-view assuming that the Ahead spacecraft was rolled by 30 degrees. The first position is on the right side of the image, and represents the position of the comet at the beginning of the day on November 30. Each subsequent point, moving from right to left, is one day later. 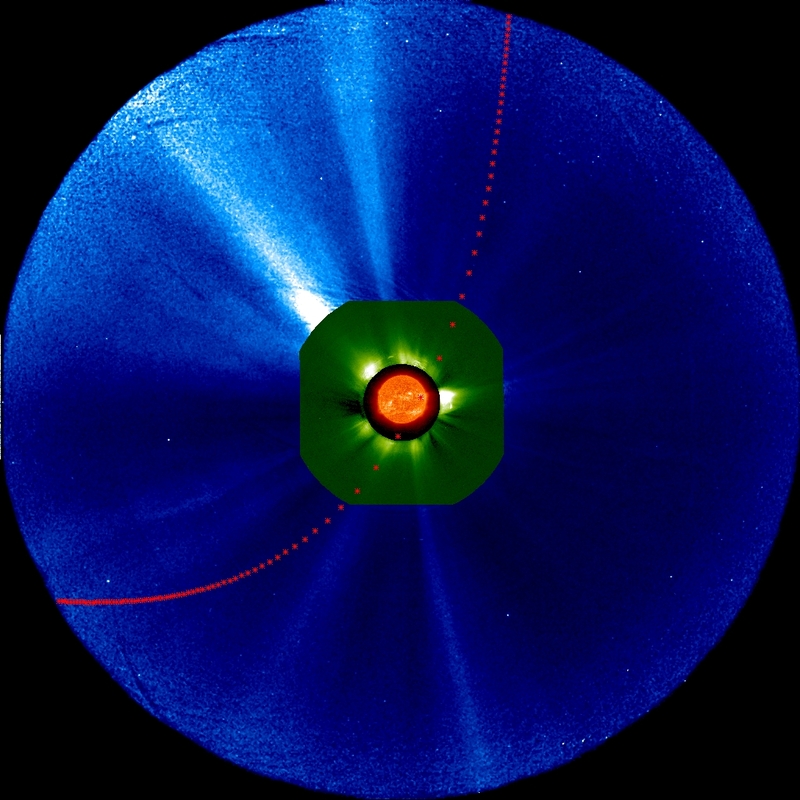 Eventually, in mid-December, the interaction between the orbit of the comet and the orbit of the Ahead spacecraft makes the comet appear to turn around, ultimately moving out of the top of the image on January 27, 2014 for this roll angle. Current plans are to roll the Ahead spacecraft for 4 hours on 3 consecutive days each week between December 3 and January 8. Predicted position of Comet ISON in HI1-A from November 30, 2013 to January 27, 2014, assuming a roll of 30 degrees. Click on the image for a larger view. During the outbound journey, the Behind spacecraft would initially need to be rolled by 290 degrees to have a good view of the comet, increasing to 315 degrees in the latter half of December to keep the comet within view. This is demonstrated in the two images below. Click on each image for a larger view. Current plans are to roll the Behind spacecraft for 4 hours each day between November 30 and December 7, and then for 3 consecutive days each week until January 8, 2014. Predicted position of Comet ISON in HI1-B from November 30 to December 20, 2013, assuming a spacecraft roll of 290 degrees. Predicted position of Comet ISON in HI1-B from December 20 to January 8, 2013, assuming a spacecraft roll of 315 degrees. All the plots on this page are based on preliminary estimates of Comet ISON's orbit. As more observations of the comet are collected, these orbital estimates will be improved over time.